France has arrested a researcher at the European Organization for Nuclear Research (Cern) for suspected links with al-Qaeda, officials have said. The 32-year-old man of Algerian descent was one of two brothers detained in the south-east town of Vienne on Thursday. Police believe they had been in contact over the internet with people linked to al-Qaeda in the Islamic Maghreb, and had been planning attacks in France. 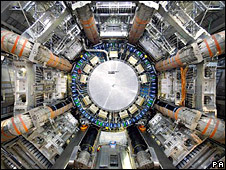 Cern's Large Hadron Collider is aiming to recreate conditions of the Big Bang. The organisation confirmed that a physicist working at its site had been arrested "under suspicion of links to terrorist organisations", and said it was helping the French police with their investigation. "He was not a Cern employee and performed his research under a contract with an outside institute. His work did not bring him into contact with anything that could be used for terrorism," it said. Cern, a civilian organisation backed by 20 member states, is Europe's leading laboratory for the study of the fundamentals of sub-atomic physics. It is based on the Franco-Swiss border just outside Geneva. The two brothers were detained for questioning on Thursday in Vienne, a town on the River Rhone about 100km (65 miles) south-west of Cern's laboratory, by security service officers acting on a warrant from an anti-terrorist magistrate. Judicial sources told the AFP news agency on Friday that agents had come across the men during a separate inquiry into the recruitment of would-be Islamist militants who wanted to fight in Afghanistan. The physicist had exchanged messages over the internet with people known to be close to the organisation al-Qaeda in the Islamic Maghreb and expressed a desire to carry out attacks, but had "not got to the stage of carrying out material acts of preparation", one said. It is not yet known to what extent, if any, his 25-year-old brother was involved. Two computers, three hard drives and several USB storage devices were removed from the brothers' home after their arrest. "The inquiry will doubtless establish what the targets were in France or elsewhere, and perhaps indicate that we have avoided the worst," French Interior Minister Brice Hortefeux told journalists. "We are in a situation of permanent alert. We follow statements made by the leaders of certain organisations day by day. We never let our guard down. The danger is permanent," he added. Al-Qaeda in the Islamic Maghreb emerged in early 2007, after the Algerian militant group, the Salafist Group for Preaching and Combat (GSPC), aligned itself with Osama Bin Laden's international network. The group claimed responsibility for a suicide bombing at the French embassy in Mauritania in August which wounded three people.